Video of someone seemingly getting short-changed by a downtown Vancouver parking meter is raising eyebrows online, but the city insists there's a reasonable explanation. 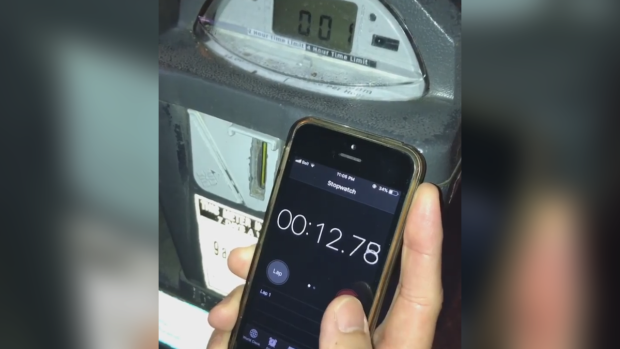 The clip shows Christian Flores putting a dime into a meter on Robson Street, then using a stopwatch app to countdown the time. The meter initially displays "2:00," but drops to "1:00" after just about 12 seconds. "What measure of time is this?" Flores asked the City of Vancouver on Twitter. The short answer, according to the city, is that 10 cents doesn't buy a full two minutes of parking on Robson. Parking on the busy street costs $5 an hour, which means two minutes would cost almost 17 cents. A dime buys about a minute and 12 seconds. "As the meters do not display seconds, partial minutes are displayed as being rounded up to the next minute. 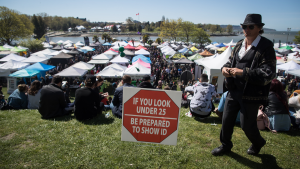 After 12 seconds, the timer simply drops down to reflect the remaining minute," a spokesperson told CTV News in an email. In other parts of the city, 10 cents would buy more time. At a meter that charges $2 an hour, for instance, a dime would pay for a full three minutes. Flores said he mostly posted the video as a joke, but was also hoping it would draw some attention to shortcomings in Vancouver's parking system. HIs biggest complaint: the fact that Vancouver's parking app doesn't refund people for unused time the way Calgary's does. "Another person can come in and pay for the same time. Essentially the city's double-dipping," Flores said. "I don't see what the issues are with just looking at what other cities are doing and implementing it."